PHOENIX, July 26, 2012 /PRNewswire/ -- Republic Services, Inc. (NYSE: RSG) today reported net income of $149.2 million, or $0.40 per diluted share, for the three months ended June 30, 2012, versus $46.5 million, or $0.12 per diluted share, for the comparable period last year. Republic's net income for the three months ended June 30, 2012 and 2011 includes a number of charges and other expenses that impacted its results. A detail of these charges and other expenses is contained in the Reconciliation of Certain Non-GAAP Measures section of this document. Excluding these items, net income for the three months ended June 30, 2012 and 2011 would have been $218.4 million, or $0.59 per diluted share, and $184.9 million, or $0.49 per diluted share, respectively. Excluding certain charges and other expenses recorded during 2012 and 2011 as described in the Reconciliation of Certain Non-GAAP Measures section of this document, adjusted earnings before interest, taxes, depreciation, depletion, amortization and accretion (adjusted EBITDA) for the three months ended June 30, 2012 would have been $624.7 million, or 30.3% as a percentage of revenue, compared to $648.7 million, or 31.1% as a percentage of revenue, for the comparable 2011 period. Revenue for the three months ended June 30, 2012 decreased to $2,060.6 million compared to $2,086.6 million for the same period in 2011. This decrease in revenue of 1.2% was made up of decreases in fuel surcharges of 0.1%, volumes of 1.3% and recycling commodities pricing of 1.0%, partially offset by increases in core price of 0.6% and acquisitions, net of divestitures of 0.6%. For the six months ended June 30, 2012, net income was $292.1 million, or $0.79 per diluted share, versus $204.7 million, or $0.54 per diluted share, for the comparable period last year. Republic's net income for the six months ended June 30, 2012 and 2011 includes a number of charges, other expenses and benefits that impacted its results. A detail of these charges, other expenses and benefits is contained in the Reconciliation of Certain Non-GAAP Measures section of this document. Excluding these items, net income for the six months ended June 30, 2012 and 2011 would have been $359.2 million, or $0.97 per diluted share, and $344.5 million, or $0.90 per diluted share, respectively. Excluding certain charges and other expenses recorded during 2012 and 2011 as described in the Reconciliation of Certain Non-GAAP Measures section of this document, adjusted EBITDA for the six months ended June 30, 2012 would have been $1,181.6 million, or 29.2% as a percentage of revenue, compared to $1,250.0 million, or 30.9% as a percentage of revenue, for the comparable 2011 period. Revenue for the six months ended June 30, 2012 decreased to $4,043.0 million compared to $4,051.5 million for the same period in 2011. This decrease in revenue of 0.2% was made up of decreases in volumes of 0.6% and recycling commodities pricing of 0.9%, partially offset by increases in core price of 0.6%, fuel surcharges of 0.2%, and acquisitions, net of divestitures of 0.5%. Republic is updating its full year 2012 earnings guidance. Adjusted diluted earnings per share is expected to be in a range of $1.91 to $1.93. This guidance assumes a full year effective tax rate of approximately 36.0%. Adjusted diluted earnings per share excludes a number of charges, other expenses and benefits, as described in the 2012 Updated Financial Guidance section of this document. Commenting on these results, Donald W. Slager, president and chief executive officer, said, "We are on track to exceed the earnings guidance that we provided in April due to the settlement of Allied's 2004 - 2008 tax years." Mr. Slager also stated, "The business is operating within our expectations. We achieved 30.3% EBITDA margins in the quarter, continued to see a stronger pace of acquisition activity and completed our refinancing activities. As a result of these refinancings, we do not have a significant debt maturity until 2016. We also returned $223 million of free cash flow to our owners through share repurchases and dividends in the second quarter." 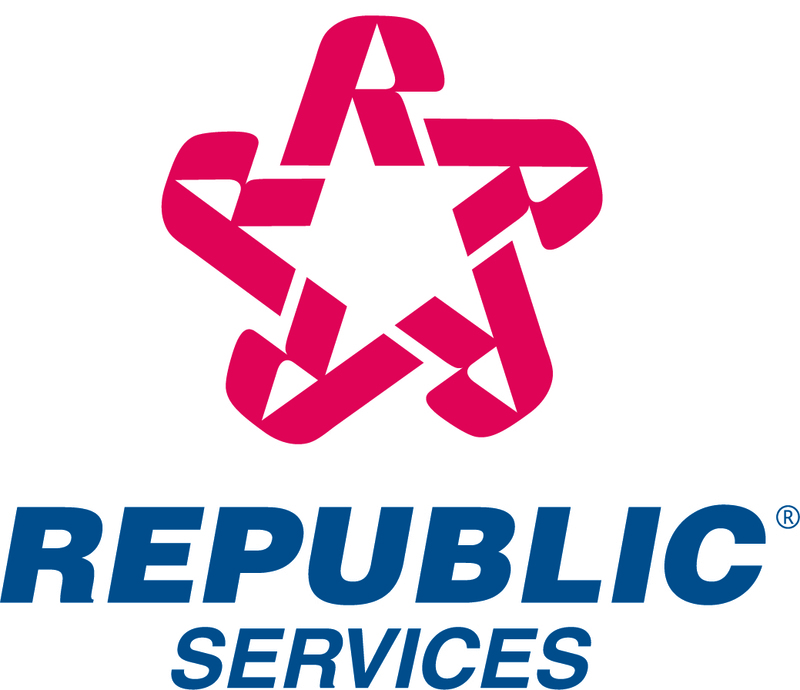 Republic also announced that its board of directors declared a regular quarterly dividend of $0.235 per share, an increase of approximately 7% over the prior quarter, for stockholders of record on October 1, 2012. The dividend will be paid on October 15, 2012. Cost of operations includes labor and related benefits, which consists of salaries and wages, health and welfare benefits, incentive compensation and payroll taxes. It also includes transfer and disposal costs representing tipping fees paid to third party disposal facilities and transfer stations; maintenance and repairs relating to our vehicles, equipment and containers, including related labor and benefit costs; transportation and subcontractor costs, which include costs for independent haulers who transport our waste to disposal facilities and costs for local operators who provide waste handling services associated with our national accounts in markets outside our standard operating areas; fuel, which includes the direct cost of fuel used by our vehicles, net of fuel credits; disposal franchise fees and taxes consisting of landfill taxes, municipal franchise fees, host community fees and royalties; landfill operating costs, financial assurance, leachate disposal and other landfill maintenance costs; risk management, which includes casualty insurance premiums and claims; cost of goods sold, which includes material costs paid to suppliers associated with recycling commodities; and other, which includes expenses such as facility operating costs, equipment rent and gains or losses on sale of assets used in our operations. During the three months ended June 30, 2012, we settled with the IRS appeals division all tax issues, including the 2002 exchange of partnership matter, related to Allied's 2004 – 2008 tax years. This settlement reduced the second quarter income tax provision by $34 million. During the three and six months ended June 30, 2012, we incurred costs related to the negotiation of certain collective bargaining agreements under which we have obligations to contribute to the Central States, Southeast and Southwest Areas Pension Fund (Central States). As part of these negotiations, we have proposed to withdraw from Central States. We do not know what the ultimate outcome of the negotiations will be. We believe that presenting adjusted EBITDA, adjusted pre-tax income, adjusted net income attributable to Republic Services, Inc., and adjusted diluted earnings per share, which are not measures determined in accordance with GAAP, provides an understanding of operational activities before the financial impact of certain items. We use these measures, and believe investors will find them helpful, in understanding the ongoing performance of our operations separate from items that have a disproportionate impact on our results for a particular period. We have incurred comparable charges and costs in prior periods, and similar types of adjustments can reasonably be expected to be recorded in future periods. Our definition of adjusted EBITDA, adjusted pre-tax income, adjusted net income attributable to Republic Services, Inc., and adjusted diluted earnings per share may not be comparable to similarly titled measures presented by other companies. As of June 30, 2012 and 2011, accounts receivable were $845.3 million and $872.3 million, net of allowance for doubtful accounts of $45.2 million and $47.1 million, resulting in days sales outstanding of approximately 37 (or 23 net of deferred revenue) and 38 (or 25 net of deferred revenue), respectively. In April 2012, we paid a cash dividend of $81.6 million to stockholders of record as of April 2, 2011. As of June 30, 2012, we recorded a dividend payable of $80.4 million to stockholders of record at the close of business on July 2, 2012, which was paid on July 16, 2012. In July 2012, our board of directors approved an increase in the regular quarterly dividend of approximately 7%. The quarterly dividend of $0.235 per share will be paid on October 15, 2012 to stockholders of record on October 1, 2012. In August 2011, our board of directors approved a share repurchase program pursuant to which we may repurchase up to $750.0 million of our outstanding shares of common stock through December 31, 2013. This authorization is in addition to the $400.0 million repurchase program authorized in November 2010. From November 2010 to June 30, 2012, we repurchased 23.5 million shares of our stock for $672.6 million at a weighted average cost per share of $28.67. During the three months ended June 30, 2012, we repurchased 6.0 million shares of our stock for $163.2 million at a weighted average cost per share of $27.06. As of June 30, 2012, we had 365.3 million shares of common stock issued and outstanding. We believe that the presentation of adjusted diluted earnings per share, which excludes loss on extinguishment of debt, negotiation costs – Central States and gain on disposition of assets and impairments, net, provides an understanding of operational activities before the financial impact of certain items. We use this measure, and believe investors will find it helpful, in understanding the ongoing performance of our operations separate from items that have a disproportionate impact on our results for a particular period. We have incurred comparable charges and costs in prior periods, and similar types of adjustments can reasonably be expected to be recorded in future periods. Our definition of adjusted diluted earnings per share may not be comparable to similarly titled measures presented by other companies. workforce factors, including potential increases in our costs if we are required to provide additional funding to any multi-employer pension plan to which we contribute or if a withdrawal event occurs with respect to Central States or any other multi-employer pension plan to which we contribute, and the negative impact on our operations of union organizing campaigns, work stoppages or labor shortages.